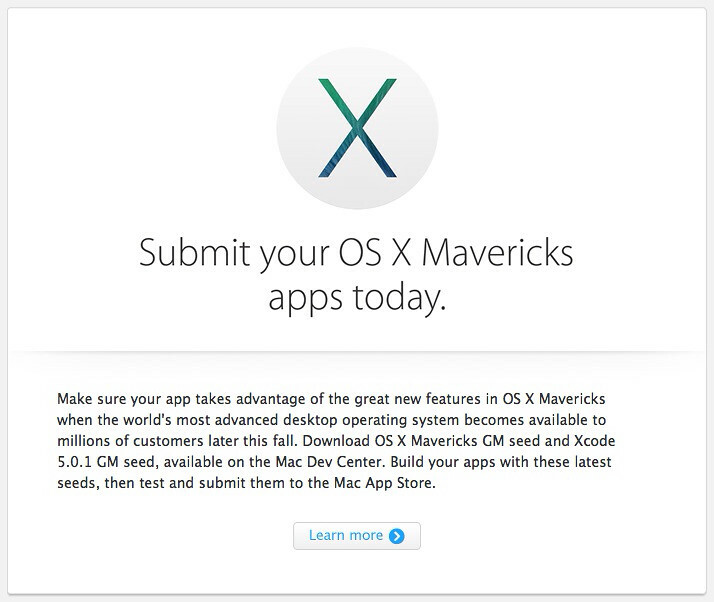 Apple has sent an email to developers asking them to submit their OS X Mavericks apps. Make sure your app takes advantage of the great new features in OS X Mavericks when the world's most advanced desktop operating system becomes available to millions of customers later this fall. Download OS X Mavericks GM seed and Xcode 5.0.1 GM seed, available on the Mac Dev Center. Build your apps with these latest seeds, then test and submit them to the Mac App Store. Apple is holding an event on October 22nd at which it could possibly launch OS X Mavericks.